Please register to include your details. Who runs Cool Antarctica? Frank Dietl (USS Arneb - 1957-1958) - Southampton New Jersey Having served aboard the Battleship USS New Jersey (BB-62) for two years (1955-57). Next assigned to USS Arneb (AKA-56) for Operation Deep Freeze III. This cruise was to go around the world, stopping in many countries. The highlight was to make our way into the Antarctica with 6 other ships and embark personnel (1956-1957 previous wintering over. At the same time disembark new personnel and Scientists (1957-1958) and supplies for one year. 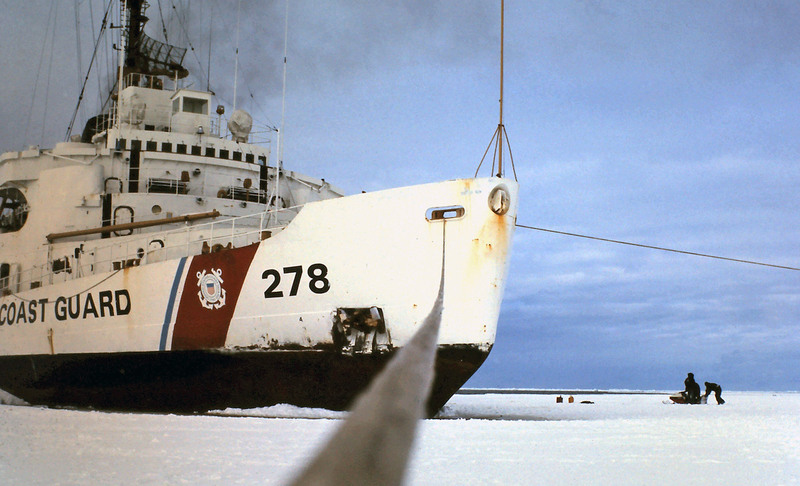 The Arneb was to supply four bases: McMurdo Sound, Cape Hallet, Wilkes Sta., Little America. I don't remember how long the ship was in Antarctica, but I do remember there was no night, always daylight, 24 hrs. Working around the clock to off load supplies. When the ship completed it's task, we sailed up to Sydney Australia. Starting this cruise I volunteered to help Fr. Birkenhauer Jesuit Priest with Catholic services. At Cape Hallett, Father left the ship to winter over. Jerry Lee Phillips (USS Arneb AKA 56 - 1959) - Pearl MS USA Would like to hear from some one. Quentin Risher (USS Arneb - AKA-56 - 1956--1959) - Tewksbury, Ma. 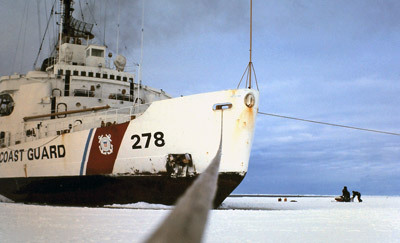 USA Took part in Operation Deepfreeze- II III & IV. Looking for any of my old shipmates. While onboard I was a Radarman 3rd class. 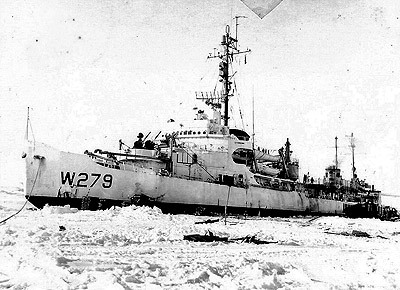 Howard Russell White (USS Arneb - 1958-1960) - Kissimmee Florida I was RM2 aboard Arneb and have been in contact with one other RM and two RDs that I served with on Deep Freeze Cruise IV and V. Would love to hear from other shipmates who were with me on the Ice. David Sweet (USS Arneb AKA 56 - 60, 61, 62) - The Villages FL I also served on board the USS Calcaterra DER 390 during Deep Freeze 64 65. We were communications relay to the aircraft flying into and out of the Antarctica. Robert Dietrich Atka, TF-43,Glacier (1954-1957) - Lemon Grove (San Diego) CA Further comments: Navy Journalist (now retired JOCM) files photos, documents of Atka Expedition (54-55), Deep Freeze I and II. Charles Hickey EM2 (USS ATKA AGB3 - 1957 - 1959) - Iowa Park, Texas I was a new sailor on my first big cruise aboard the USS Atka. I enjoyed the adventure and will always remember the trip. I would like to locate or purchase a USS Atka Operation Deep Freeze III Cruise Book 1957-1958. Any help would be appreciated. Thank you. Rich Humphreys(USCG Eastwind W279 - 1964) - Deptford NJ I am looking for a shipmate with the last name Planton possibly from Oregon. Jerry Murdock (ET3 - ET2, USCGC Eastwind, WAGB-279 - 1962 - 1965) - Onalaska, TX, USA Eastwind was my first ship. We were inside the Antarctic Circle 126 days straight during the '62-'63 season (McMurdo, Adare, Hallett, Williams Field & vicinity). I liked it so much I shipped for 6 later in '63. During the '63-'64 season we went to the Palmer Peninsula to survey the area around "Base N" on Anvers Island in preparation for construction of Palmer Station. I volunteered to go with the Seabees on the shore party for the survey. Since they needed someone to maintain the communication gear, I got lucky. Even luckier, the comm gear worked fine, so I was able to help with the survey. During the '64-'65 season we went back to McMurdo, but the ice mostly moved out by itself, so we had time to do more "sightseeing" than before. A bunch of us were able to get a tour of Robert Falcon Scott's 1911 base camp guided by Sir Charles Wright - who was the physicist & glaciologist on the Scott expedition. I wanted to stay on the Eastwind, but had to transfer in '65. Now retired CWO4(ELC). Zane Lile (USS Wyandot 1958/59, USS Glacier 1958/60) - Russellville Arkansas Interested in hearing from anyone in, are on, the ice in that period of time. Are others who served on either ship. Stephen G. Sochran (US Glacier - 1962-63 or 1963-64) - Manchester NJ, My husband Stephen G. Sochran was in the South Pole on the U S Glacier. Not sure if it was 1963 or 64. He lost his cruise book and I have been searching for one with no luck. Any suggestions? Brian Universal (HU2 / USS Glacier - 1957, 1958) - Eden, NY Looking for people who were associated with HU2 from Lakehurst, NY, either in 1957 or 1957. John C. Burritt (1958 - 1959 summer support) - Fleming Is., FL USA - I was one of 3 Navy HU-1 helicopter pilots. We did ice recon, and cargo and personnel hauling. One of the most memorable trips was taking Sir Raymond Priestly, a British Geologist, out to the Shackleton and Scott huts. It had taken him 6 days to go from McMurdo to the huts by dogsled years ago. We did it in about 20 minutes. Joe Rogers (1966 - 1969) - Grand Rapids, MI USA Operation Deep Freeze 1966, start of construction on the new Palmer Station. Operation Deep Freeze 1968 McMurdo resupply. Learned how to have fun in the "Old Guard"!